« Cows in a Class! 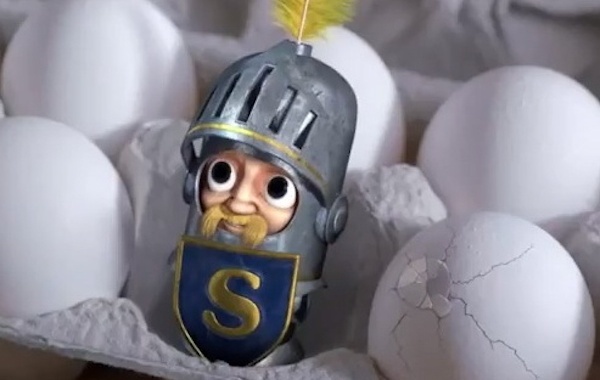 Introduced in 2012, Sir Can-A-Lot is on a crusade to “rescue the world from routine meals.” This Is far preferable, I suppose, to joining ISIS, and the diminutive knight is polite if annoyingly enthusiastic about the SPAM product that he endorses as “glorious SPAM!” And I thought that I needed a life! Now in my dark little mind, I would like to see this scene rewritten to resemble a memorable one in the Gremlins films where a housewife becomes a kitchen samurai when confronted by invading gremlins, using household appliances against the invaders to deadly effect .– Let’s have the lady of the house grab the little knight, throw him in the microwave, and see if he sparks! Consider also throwing him in the sink garbage disposal to see how protective that tiny suit of armor really is! With a kitchen array of food processors, blenders, and cutting knives the possibilities for home defense are both varied and entertaining. This entry was posted on June 15, 2015 at 1:45 pm and is filed under absurdities, anthropomorphic, strange, television. You can subscribe via RSS 2.0 feed to this post's comments. She done kidnapped my granny. My bad! TJW never sang for Motown. He was what you might call “melanistically impaired.” But, then again, I used to think LeAnn Rimes was the baby sister of Busta Rymes!! So, what do I know?